"Freud&apos;s great unanswered question, &apos;What does a woman want?&apos; seems to be hanging over this round of collections, and it&apos;s already turned up some funny, off-beam stabbings around in the dark. Funny, that is, because isn&apos;t it obvious? What we want is a casual way of dressing that&apos;s also formal enough, new yet not ridiculously gimmicky, confident yet not egregiously aggressive, traditional in a comfortable way, yet also fresh in such a manner that we feel compelled to buy it. 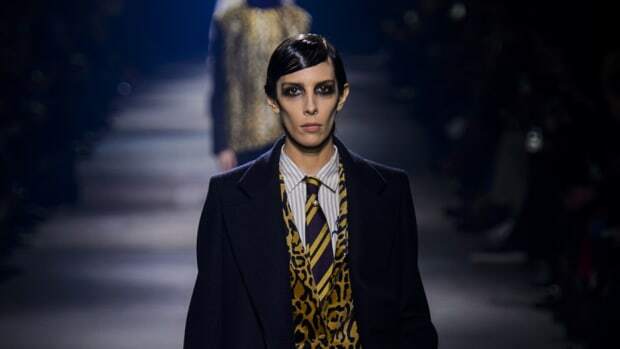 Well, let&apos;s hand it to Dries Van Noten for coming up with a personal squaring of all those apparently oh-so-difficult contradictions." -Sarah Mower, in her review of the collection. The designer offered a more glamorous approach to genderless dressing.